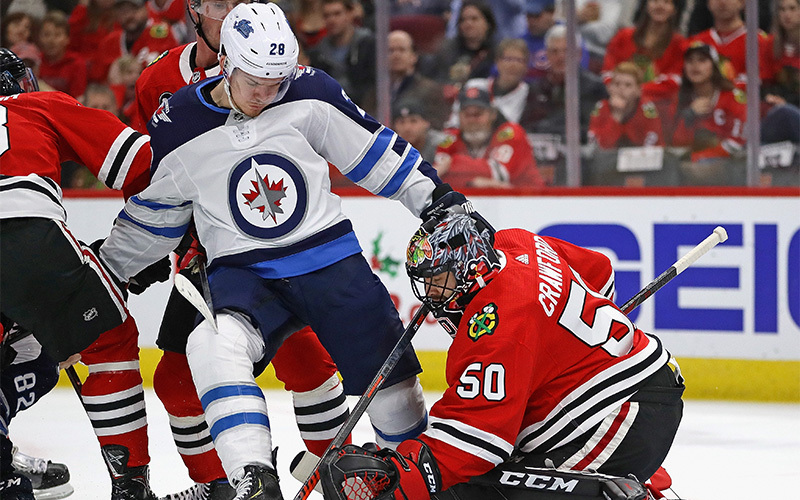 The Winnipeg Jets begin their final road trip of the regular season tonight when they meet the Chicago Blackhawks at United Center…The Jets are coming off a 1-3 record during four-game homestand, which ended with a 3-1 loss to the Montreal Canadiens on Saturday night…Winnipeg continues the road trip tomorrow against the Minnesota Wild. The Jets have clinched their spot in the 2019 Stanley Cup Playoffs…It’s the first time in franchise history that the Jets have reached the playoffs in back-to-back seasons…If the playoffs started today, the Jets would host the Dallas Stars, who hold the Western Conference’s first wild card spot, in the first round of the playoffs. Tonight and tomorrow marks the last of nine back-to-back sets the Jets have this season…Winnipeg is an even 5-3-0 in the first game and 5-3-0 in the second game of back-to-backs this season…Last season, the Jets went 4-3-2 in the first game of nine back-to-backs and 4-4-1 in the second game. Winnipeg is 20-17-0 on the road this season, which has tied a franchise record for most wins in a season from the 2014-15 and 2018-19 seasons…The Jets have won two of their past three road games…Winnipeg hasn’t lost three consecutive road games in regulation since Dec. 10-20/16…Winnipeg is 13-for-14 (92.9%) on the penalty kill in its past five road games…The Jets have scored 29 goals in their past nine road games…Blake Wheeler leads the Jets in scoring on the road this season with 38 points (10G, 28A) in 37 games…Patrik Laine leads the Jets with 19 goals on the road. The Jets are 12-11-0 against Central Division teams this season…Winnipeg is 3-6 in their past nine games against Central Division teams and all three wins have come against Nashville (Jan. 17 at NSH 5-1 W, Mar. 1 vs. NSH 5-3 W, and Mar. 23 vs. NSH 5-0 W)…The last time the Jets beat a Central Division opponent that isn’t Nashville was Jan. 8 when they beat the Colorado Avalanche 7-4 at Bell MTS Place…Since the start of the 2016-17 season, the Jets are 46-28-4 against Central Division teams, which is second in the NHL…In that same time frame, Blake Wheeler leads all NHLers in scoring against the Central Division with 97 points (28G, 69A) in 78 games, while Mark Scheifele is third with 89 points (36G, 53A) in 70 games. Dating back to Apr. 3/16, the Jets have won 12 consecutive regular season games in April…Eight of the 12 wins have been by one goal, including two in overtime and one in a shootout…The Jets are unbeaten in regulation in their past 20 regular season games in April, going 18-0-2 since Apr. 10/14…Blake Wheeler leads current Jets in career scoring in April with 50 points (22G, 28A) in 54 games, while Mark Scheifele is averaging a point per game with 17 points (6G, 11A) in 17 games. Blake Wheeler had an assist on Thursday to reach 69 assists this season, which ties Marc Savard’s franchise record for most assists in a season from the 2005-06 season…His assist on Thursday ended a four-game pointless streak…With 89 points (20G, 69A), Wheeler is guaranteed to have better than a point per game this season for the second consecutive season… Wheeler has scored 20 goals or more in six consecutive seasons…During the past four seasons, Wheeler’s 237 assists are second most in the NHL. Defenceman Jacob Trouba has eight assists in his past seven games to reach 40 assists in a season for the first time in his career…Trouba leads Jets defencemen in scoring with a career-high 47 points (6G, 41A) and has a career-high 0.60 points per game. Connor Hellebuyck had his most successful month of the season in March with a .926 save percentage in 12 games…He posted a pair of shutouts (Mar. 20 at ANA 3-0 W and Mar. 23 vs. NSH 5-0 W) and faced 35 shots or more in seven of his 12 games. Winnipeg has won four in a row against Chicago and five of the past six games. The Jets can sweep the season series for the first time in franchise history (when playing multiple games in a season) with a win tonight. The Jets have scored 28 goals in the past six meetings with the Blackhawks, including 16 in the three games this season. The Jets are 33-for-34 (97.1%) on the penalty kill in their last 13 games against Chicago and are a perfect 20-for-20 on the penalty kill in their past nine games against the Blackhawks. Winnipeg has scored a power play goal in four consecutive games (6-for-16, 37.5%) against the Blackhawks. Blake Wheeler leads the Jets in scoring against the Blackhawks with 27 points (9G, 18A) in 31 career games. Goaltender Connor Hellebuyck is 7-4-0 with a 2.30 goals-against average and .926 save percentage in 11 career starts against the Blackhawks. Jets’ GM Kevin Cheveldayoff formerly held the position of Assistant GM with the Blackhawks for two seasons from 2009-2011, winning the Stanley Cup with Chicago in 2010. The Jets’ Dustin Byfuglien won the Stanley Cup as a member of the Chicago Blackhawks in 2010. Winnipeg is the birthplace of two Blackhawks: Jonathan Toews and Duncan Keith. In 2012-13 during the lockout, Patrick Kane played in Switzerland for EHC Biel, where Nikolaj Ehlers was playing. Patrick Kane and Blake Wheeler played together for the United States at the 2014 Olympic Games in Sochi, RUS. Needs one shorthanded assist to tie Marty Reasoner and Patrik Stefan (7) for the second-most shorthanded assists in franchise history. Needs three points to reach 200 points for his career. Needs seven wins to reach 700 as an NHL head coach. Needs five points to reach 200 points as a member of the Jets. Needs eight goals to reach 200 as a member of the Jets franchise. SCHEDULE UPDATE: The start time of Game 6 of the First Round Series between the Winnipeg Jets and St. Louis Blues has been set for 6 p.m. on Saturday, April 20, in St. Louis. SCHEDULE UPDATE: The start time of Game 5 of the First Round Series between the Winnipeg Jets and St. Louis Blues has been set for 7:30 p.m. on Thursday at Bell MTS Place. Morning Skate – 10:30 a.m.
Game 5 – Jets vs St. Louis – 7:30 p.m.
Game 6 – Jets at St. Louis – 6:00 p.m. Copyright © 2019 Jets Media. All Rights Reserved.